Summary: Spam Response, available to Android users through the Google Play store is an effective app with one aim; to eliminate the ever-growing issue of text messaging or SMS spam. That is where Spam Response comes into play. 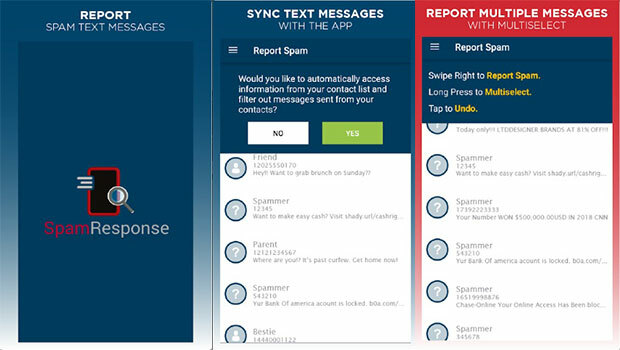 The intuitive app has been designed to allow user to help prevent SMS spam by reporting the unwanted messages they have received. When you first open the app you’ll notice how similar to an ordinary text messaging app SpamResponse appears. Users need simply to scroll through the recent messages’ list and swipe right on any unwanted or unsolicited messages. Once you’ve swiped right the sender will be reported for SMS spam. Not to worry, if you’ve accidentally swiped right on the wrong message, the app does provide the option to the mistake and get back to filtering out the real spam. The app has great features with only one real drawback; its unattractive interface. The interface is perfectly functional but could use a good face lift in future updates. Overall, for anyone willing to join in the battle against SMS spam, Spam Response is an important application in working towards a spam free future.